ARBURG is one of the world’s leading manufacturers of plastic processing machines. 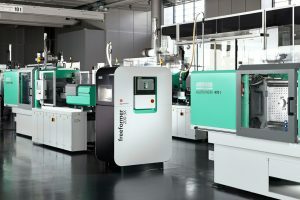 The portfolio includes ALLROUNDER injection moulding machines with clamping forces between 125 and 6,500 kN, the freeformer for industrial additive manufacturing, robotic systems, customer- and sector-specific turnkey solutions and further peripherals. Everything that Arburg does is centered around production efficiency of the customer by taking into account the entire value-added chain. The objective is to enable the customers to manufacture their products, whether one-off parts or high-volume batches, in optimal quality and at minimum unit costs. An international sales and service network guarantees first-class, local customer support. ARBURG is represented by its own organisations at 33 locations in 25 countries and by trading partners in more than 50 countries. The machines are produced exclusively at the parent factory in Lossburg, Germany. From a total of around 3,000 employees, around 2,500 work in Germany. About 500 further employees work in ARBURG’s organisations worldwide. In 2012, ARBURG became one of the first companies to gain triple certification: in accordance with ISO 9001 (Quality), ISO 14001 (Environment) and ISO 50001 (Energy). ARBURG covers the entire industrial production spectrum for high-quality plastic parts – from the additive manufacturing of one-off parts through to high-volume production. The interaction of the two processes enables the application-specific individualisation of mass-produced parts. 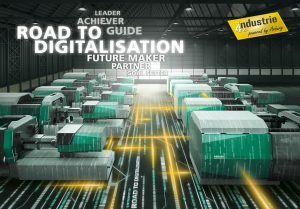 including peripheral equipment, ARBURG is an industry leader with regard to Industry 4.0. Data integration with the ARBURG host computer system creates transparency and consistency to enable optimum utilisation of the entire production capacity.